According to the Federal Motor Carrier Safety Administration (FMCSA), there are 15 million crashes in the U. S. every year and 20 million claims. For fleet managers, collisions are not rare occurrences: 10% of commercially used vehicles of all class types are involved in a collision each year. Managing these accidents and the claims process is often part of a fleet manager’s job. Having access to objective reports can help them react faster to a collision while streamlining the process after the initial impact. New microservices, such as CalAmp’s CrashBoxx™, offer a new way to access that information, whether it be as a service or a report purchased on a per incident basis. When a collision occurs, you want to know about it right away so an automated notification in near real time is helpful; however, you only need key data. The alert notification should provide the location along with the date and time of the collision. This information helps fleet managers and operations personnel get emergency assistance to their driver faster and assess the situation, such as rerouting appointments or recovering a shipment. These notifications can be used as the First Notice of Loss (FNOL) to start the insurance claim process. They provide a quick snapshot of what happened, however, you may require more information than just a date and time. After the initial response to a collision, the fleet needs to recover from the outcome. There could be any number of activities needing to be completed ranging from company reports, vehicle repairs, route adjustments, more training or a replacement purchase in addition to the claims process. 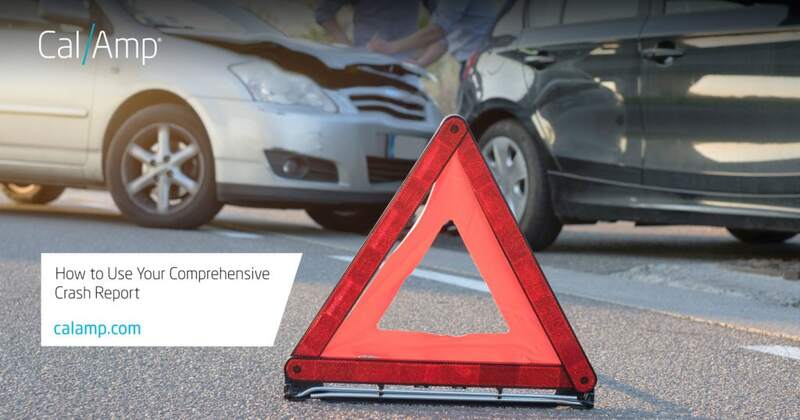 A comprehensive collision report provides information for many of those activities because it contains more details than the initial alert notification. The report is a great supplement to the standard accident report form where a detailed description is required. It is also important documentation for the claims process., making it easier and faster to file an insurance claim, accelerate processing and reimbursement. In some instances, a full collision report can help prove your driver was not at fault (especially when paired with a vehicle’s video footage). Another benefit is the reduction or elimination of a fraudulent claim, which ends up saving everyone money. CalAmp customers have the ability to purchase a comprehensive report that contains much of the data in the fleet manager’s list mentioned earlier. It is available through the CrashBoxx portal – using the link in the alert notification. Reviewing the data over time reveals trends and valuable insights that can help reduce future risk. It assists fleet managers in improving their operations for greater efficiency and safety. How would you use your collision report? To learn more about how CrashBoxx can help you manage your fleet collisions, visit our page here.